It is so popular that it is plastered on a thousand devotional posters – ten thousand fridge magnets, and I have no way of counting how many bumper stickers it might perhaps be found on – which is odd. It’s odd for a couple of reasons. For the prophet Jeremiah is not exactly someone associated with a message which we’d all want to buy into. God’s plan for Jeremiah was that he go into the heart of the darkness of God’s people to announce God’s impending judgement on their wickedness – and boy did he suffer as a result – one in the long line of those God sent to his people to call them to repentance culminating in his sending his Son whom they crucified . 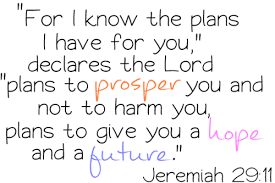 . . so quoting Jeremiah on ‘God’s plan for your life’ . . . well we might say that it is asking for trouble! And Jeremiah, as one faithful to God’s plan for his life does not hold back – who is this people he is called to? Well by the time of the prophecy about God’s plan they are in exile and The LORD addresses these words to them : Your hurt is incurable, your wound is grievous. There is no one to uphold your cause, no medicine for your wound, no healing for you. Apart from the use of oil etc. to produce such commercial tat, the real problem with fridge magnet theology is that fridge magnets aren’t large enough 🙂 ‘I have plans for you, plans for your welfare and not for harm, to give you a future with hope. . . . because you are incurably sin sick – all those false gods you have run after have let you down and I’ve taken you into exile because of them . . .’ These are the people that God has plans for . . .
And immediately we understand that God’s plans for us have little or nothing to do with ‘the house we’ve always dreamed of’, ‘things working out well in our careers’, or ‘finding the man or woman of my dreams and living happily ever after’. God’s Plan for his people is that he will save them from the consequences of their abandonment of Him – put another way, that he will save them from death and hell, in and through Jesus . . . and without wishing to harp on about a theme I have spoken of these past weeks, of all those ‘fridge magnet dream’ plans . . . where is Jesus in any of them??? So, let us come to James the brother of Jesus and pillar of the Jerusalem church – and his meditation upon how God’s plan is worked out in us when we come into the light. Firstly he begins with this acknowledgement – Every generous act of giving, with every perfect gift, is from above, coming down from the Father of lights, with whom there is no variation or shadow due to change. When Jesus says to the wealthy man who calls him good teacher ‘Why do you call me good, only God is good.’ He is pointing to one of the most fundamental truths of existence, the Goodness of God. What else can explain God’s desire to rescue his people who have utterly abandoned him – what else can explain God’s plan for us, indeed a plan that extends to the whole created order as our abandonment of the command of God has led to a Creation which mirrors the humans who have sought to act as God within it. The Goodness of God we may well say is that which gives Hope, when humanly there is only despair – God’s Goodness is Life from Death. James goes on ‘In fulfillment of his own purpose [putting his plan into Action] he gave us birth by the word of truth, so that we would become a kind of first fruits of his creatures.’ He gave us birth by the word of truth – through His Living Word, His Word made flesh, God gives us new birth. ‘Into a living hope’ as St Peter puts it, ‘by the resurrection of the dead’ – there you are again, a people beyond hope are given Hope, a people who are dead in sin and wickedness are given new birth, by this Word – that they might become a kind of first fruits of his creatures . . . The Genesis narrative of ‘creation’ is nothing more nor less than a foreshadowing of THIS Creation. God coming to his people in Jesus is His plan, ‘since before the foundation of the world’ Jesus indeed is the lamb who was slain, from before the foundation of the world. Before ever there was sin, before ever there was a world, God’s plan has been to rescue his people and to reveal his Goodness. Yet, this plan requires our participation You must understand this, my beloved: let everyone be quick to listen, slow to speak, slow to anger; for your anger does not produce God’s righteousness. Be quick to listen! Quick!! — the Living Word speaks – ‘This is my beloved Son – listen to Him!’ – The Words he speaks are Spirit and truth – they are Life eternal. Quick to listen. Slow to speak – as James will remind us in a couple of weeks, our words are dangerous – not least those who presume to be teachers, for too easily does the preacher end up teaching human precepts as doctrines. This is why I ask that you pray for all those who presume to teach that they may, both by their life and doctrine, set forth thy true and lively Word, and rightly and duly administer thy holy Sacraments. That my brothers and sisters is why we should pray for our clergy – not that their lives will work out well according to the standards of the world, but that they might ever hold fast to the Life giving word of truth and not descend into the evil of teaching human precepts as doctrines, which Jesus condemns. Quick to listen – slow to speak – slow to become angry. The Church has always taught that anger is one of the wicked thoughts, the deadly sins (in Catholic tradition) – that the only valid anger was anger against our own sins. For too easily we stand in angry judgement of others and find ourselves, in the words of the crucified thief, under the same condemnation. ‘Man’s anger does not produce God’s righteousness’ – and who would dare presume to announce Their anger to be that of the Living God?? The Word of Christ, in us, which alone has power to heal and save our souls . . . I will say little on this point, but to note that it is in this day when the language of sin and soul has all but disappeared even from the discourse of the Church, Lord have mercy on us, that the evil of euthanasia rears its head . . . But let us be clear – this welcome for the word is not simply a meditative exercise – as we are to rid ourselves of the rank growth – active – so James says in receiving the word, Act on it!! But be doers of the word, and not merely hearers who deceive themselves. There are many many deceptions abroad in this age. As James points out, if we do not bridel our tongue, we deceive ourselves, our religion is worthless, for we are unrestrained, our energy is wasted. But one of the most clever schemes of our enemy is that of encouraging mediation on the word as healing in and of itself – this is no better to us that gazing lovingly at the medicine in the bottle – or seeking to feed ourselves by reading ‘Good Food magazine’ but never cooking. It is the religion of nice thoughts, it is a vapour and a mist, and highly seductive for that for it requires no effort on our part. cf Luke 13:24 The man Jesus heals he commands – ‘take up your mat and walk.’ God has given us birth to be a kind of first fruits of his creatures and like new born babies we move from passivity, to the strenuous work of participation in His Life . . . Yes, Meditate upon the word – accept it – and Do it. Those who love me, obey me, Jesus says – again Those who hear my words and do them are like those who build their house on the rock, that in the day of Judgement, they may stand firm. As James, Jesus’ brother and our puts it – But those who look into the perfect law, the law of liberty, and persevere, being not hearers who forget but doers who act—they will be blessed in their doing. As I said – the Jeremiah fridge magnet is not large enough; wanting God’s plans for us to be about Our hopes and dreams,it is cut off half way through. Next postWhat is an ‘I’? ?